In the remote Kimberley region the school day is underway, but class subjects – and the students taking them – are not what you might expect. On boab-dotted Leopold Downs Station, local Aboriginal students and pupils from Melbourne spend part of their day learning how to muster cattle, repair fences and forage for bush tucker. Established in 2010, the Yiramalay/Wesley Studio School is a unique partnership between Wesley College – one of the top co-educational independent private schools in Melbourne – and the Indigenous people of the Fitzroy Valley communities in the Kimberley. “When Melbourne students come up here, a lot of them haven’t been out bush and many haven’t met Aboriginal people, so it’s quite a culture shock,” says Ned McCord, the Studio School’s executive director and a former cattleman. Situated on a working cattle station 85km from the small town of Fitzroy Crossing, the Studio School enrolls around 60 Aboriginal students, who experience “cultural, spiritual and academic learning” to help prepare them for future employment and education. As part of the two-way learning venture the school hosts up to 120 Year 10 students from Melbourne each year. In groups of 20 to 25, the Wesley College teenagers undertake a three-week induction based on life in the Kimberley. The two-way learning continues when Aboriginal students pack up and relocate to Melbourne to experience mainstream education and metropolitan culture. 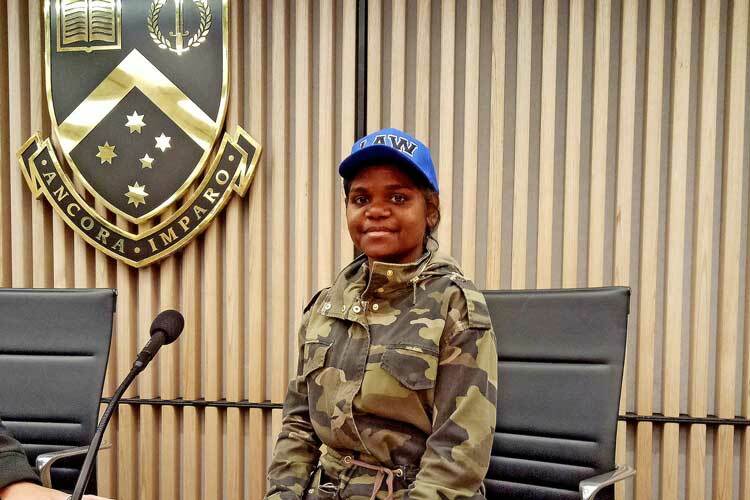 Simara Munda, a Pilbara-born 16-year-old, is one of the 60 Aboriginal students in residence at Yiramalay. She spends half of each year at Wesley College. “My experience has included meeting new people and learning about them and how different the local Bunuba culture and my culture, Yinjibarndi, are,” says the Year 11 student. At Wesley College the Yiramalay students can take up opportunities such as a science camp at the University of Melbourne, learning about media and broadcasting at RMIT University’s radio station, and visiting ABB’s Melbourne base to operate an industrial robot. The overall retention rate of Yiramalay students is significantly higher than the national average for Aboriginal students – 70 per cent of students at the Studio School participate in Year 12, while the national average is 19 per cent. Last year five students graduated Year 12. However, the number of students who complete Year 12 is not the only measure of success. “Nearly 75 per cent of all Yiramalay students enrolled at the school since 2010 are now either employed or continuing their education,” says Mr McCord. Currently three staff members are former students who completed year 12. “It’s home for them – and I’ve got more alumni wanting to come back to work or volunteer,” says Mr McCord. The positive impact of the school is also seen in the health of the Indigenous students, including improved mental wellbeing, and better sleep and physical fitness, he adds. Experiencing Kimberley life also changes the career aspirations of the Melbourne students. In late May the Studio School held a celebration to mark the official opening of new accommodation. “Students in Years 10, 11 and 12 were on bunk beds, and now they are two to a room. We bought all the beds locally in Broome and they’ve got lovely doonas. In the first term, with the air conditioners, they loved that as well,” says Mr McCord. The $1.4 million project was funded in part by contributions from the Commonwealth Government, while half came from fundraising efforts. In one of the world’s most corrupt cities where child sexual abuse is rife, remarkable young Australian Genevieve de la Reux has made a commitment to rescuing and rehabilitating boys and girls through a foundation she set up in Nairobi all on her own. Swim with sharks and traipse through untouched rainforest. Shellharbour, just 90 minutes from Sydney, is an adventure lover’s hidden gem. A getaway in the Tweed Valley offers just the right dose of relaxation, indulgence, nature and exploration.